Annuity sales companies use misleading sales tactics to shill their fee-laden insurance products. InvestmentNews magazine, an otherwise excellent weekly publication, often has its cover wrapped in a paid advertisement. 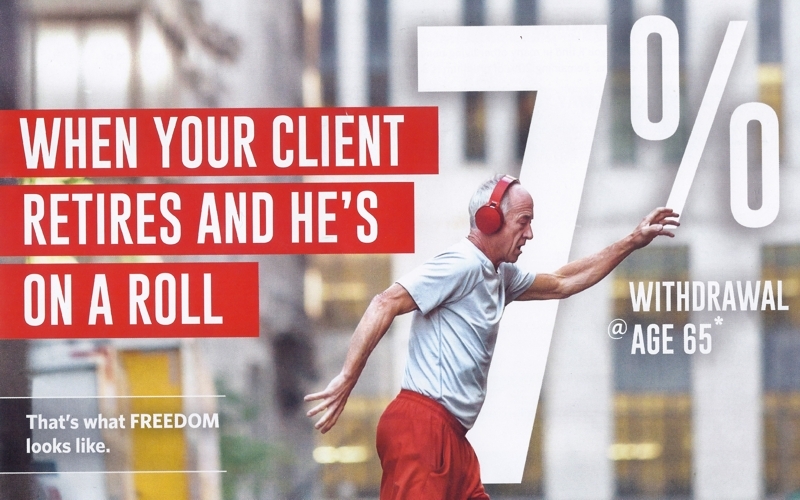 The October 1-5, 2018 issue was wrapped in an advertisement featuring an older gentleman rollerskating with the large graphic claim of ” 7% WITHDRAWAL @ AGE 65* “. Not knowing that the product was a Transamerica variable annuity and knowing that the claim could not be true, I was drawn to look at the details to see how far the product sales team had stretched the truth via their tiny asterisk. In other financial planning literature, when a percentage is given as a withdrawal rate it is assumed that you can immediately begin annually spending that portion of your assets and adjust upwards for inflation each year. It is also common sense that a “withdrawal at age 65” means you are going to be withdrawing money starting at age 65. The advertisement appeared to be as misleading as possible. As I understand this footnoted footnote, the 7% is calculated as a fixed dollar amount at age 65 but you are not allowed to withdraw just yet. After not withdrawing for 6 years, at age 72 you are then allowed to withdraw that fixed dollar amount going forward. Now I confess that I am not sure that I have understood all of their so-called straightforward withdrawal rate. I suspect the reality is even worse than I am assuming. I don’t understand, for example, why the phrase “up to” has been put in front of 7%. And I am not 100% certain that I have understood “living benefit years” correctly. What I do know is that six years of no withdrawals is huge. Inflation averages 4.1% historically. And equity investments, on average grow at a rate of 6.5% over inflation. After six years, earning just a 7.1% return (3% over the historical inflation average), your $1M would have grown to $1,509,165. In terms of purchasing power, I would say that this is a pitiful withdrawal rate which will continue to dwindle by inflation each year. We believe there are many amazing alternatives to annuities. This ad is misleading enough that I would call it fraudulent. In addition to all of the other reasons people hate annuities, seemingly fraudulent advertising and sales techniques is a major factor. Why would you trust someone posing as a financial advisor and then purposefully misleading you? What Is The Alternative To An Annuity?